Want to satisfy your sweet tooth, while contributing to a good cause? 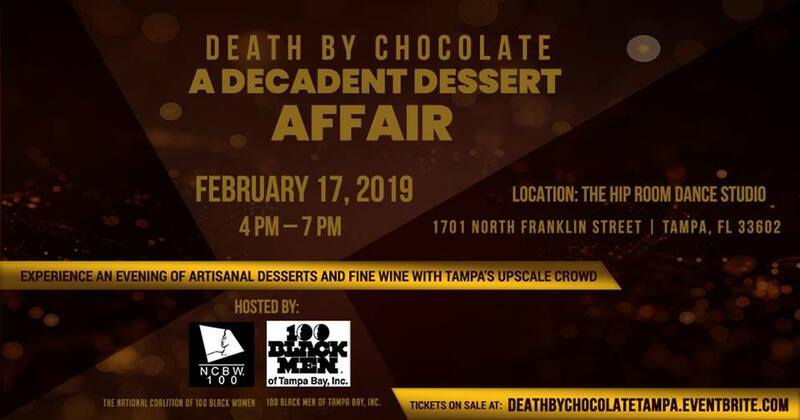 The Tampa Bay Chapter of the National Coalition of 100 Black Women, Inc. will host its 5th Annual Death by Chocolate. A Decadent Dessert Affair. Have your chocolate and eat it too as you sample sweets from local culinary artists and sip wine at this chic event in Tampa Heights. All proceeds will go toward providing community programs to educate and empower local women and girls. Join us on Sunday, February 17, 2019 at The Hip Room Dance Studio, 1701 North Franklin Street Tampa, FL 33602, from 4:00 p.m. – 7:00 p.m. The evening will feature local restaurants, chefs and exhibitors from the Tampa Bay area-each serving a delectable chocolate entrée, drink or dessert. Tastings and wine will be available for patrons throughout the night, in addition to a live auction, music and prizes.